Most people enjoy summertime, but it can take a toll on home appliances. With kids out of school, families typically use them more frequently and the heat and humidity forces them to work harder and longer. Extreme heat, summer storms and power outages can also damage appliances. All these factors can spell trouble if you’re not performing routine maintenance. Clean your refrigerator’s condenser coils. Condenser coils help the refrigerator stay cool by releasing heat from the compressor. Dirty coils result in the refrigerator having to work harder to cool, which can result in expensive cooling system repairs. Clean the condenser coils at least twice a year, removing dirt, pet hair, food and more. If you have an older fridge, the coils might be painted black and mounted on the back. Newer refrigerators often have the condenser coils on the bottom. It’s easy to clean them with a vacuum and a coil brush, available through SearsPartsDirect.com. Clean and inspect your refrigerator’s door gaskets. A leaky door gasket, the rubber strip that runs alongside the door to form an air-tight seal with the fridge, can result in your refrigerator trying to cool the entire kitchen rather than the food and drinks inside. Clean the gasket with a mild cleaner and then check the seal integrity with a solution of soapy water (just like you would do with an inflatable mattress). You can also use the dollar bill approach—close a dollar bill in the door so that it is only halfway in the fridge. If your gasket isn’t tight enough, it won’t hold the bill firmly in place. If the dollar bill falls out or slides down, look at scheduling a professional to replace the gasket. Change the air filters in your HVAC system. Homeowners should regularly change their air filters, as dirty ones can lead to increased energy bills and damage systems. Experts recommend changing air filters every three months at minimum and monthly during the summer if they are dirty. Clear away debris and clean HVAC condenser coils. Condenser coils release the heat from the AC unit to the outside. Dirty coils can reduce the unit’s ability to cool your home, forcing you to run it longer and use more energy. To clean, you’ll need a garden hose, a spray nozzle and a water source. Before you begin, disconnect the power to the air conditioner. Most AC units have a shutoff box nearby. If there’s no shutoff box, find the circuit breaker in the home that controls the AC unit and turn the power off. First, clear away debris and trim any overgrown grass or weeds near the AC unit. 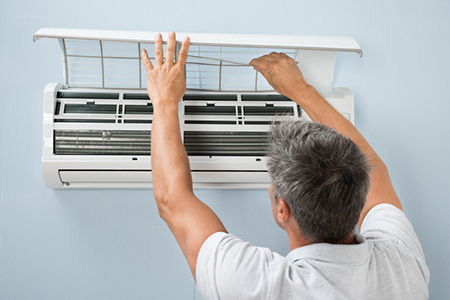 There is no reason to remove covers or fins from the air conditioner to clean the coils. Simply take a garden hose with a spray nozzle and wash the fins, (the outside of the AC unit) with regular water. Start with the top and work downward, washing away debris and blockage so the coils can release heat efficiently. Clean the dryer lint trap and moisture sensors. Our expert technicians recommend you clean the dryer lint trap after every single load to ensure your machine is drying clothes as quickly as possible, which will save you time and energy. Periodically, use a dryer lint brush to dislodge and remove any lint that the screen didn’t catch and clean up with a vacuum. Every six months or so, remove and wash the lint screen to remove build up, especially if you use dryer sheets. Clean and inspect your gas grill. With outdoor entertaining season here, now is a great time to make sure your gas grill is in working order. Make sure the gas is off, check the manual for how to remove the burners, then brush out the grill’s interior and burner ports with a wire brush designed for grills. When you start up the grill, let it burn for five to 10 minutes before using. Use cooking spray on the burners to prevent rust and tarnish and to keep food from sticking. Before using your grill, you should also check for a tight seal and for leaks and cracks in the hose going to the propane tank or natural gas supply line. Use soapy water to detect leaks. If bubbles start to form, there’s a leak. If there’s a leak, replace it, as this can be a fire hazard. Most homeowners are comfortable performing these routine maintenance tasks. If you don’t have time or want to maintain your appliances, Sears Home Services can do it for you and your clients with Kitchen & Laundry Appliance Check-Ups and HVAC Maintenance. Sears Home Services expert technicians repair and maintain more than 180 appliance brands—not just those sold by Sears. Chip Smith is the chief marketing officer of Sears Home Services, a national provider of appliance services. Sears Home Services, the House Expert for Homeowners, has more than 5,000 expert technicians who make nearly 7 million service calls annually. For more tips on maintaining your home, please visit SearsHomeServices.com/blog.